Please note: These are extended-length lug bolts and are meant to be used with wheel spacers..
Audi, Mercedes, & Volkswagen that use 14x1.5 Lug Bolts. - Vehicle must use 14x1.5 threaded lug bolts. - Shank Length: Verify this 45mm Shank Length Bolt is the correct size. Buyers must measure their OEM bolt and spacer to determine if this is the correct length. - Seat Type: Check your wheel lug hole. These bolts will only work if your lug holes are Ball Seat (Radius). [AUTHENTIC] Precision European Motorwerks Lug Bolts with branded packaging. 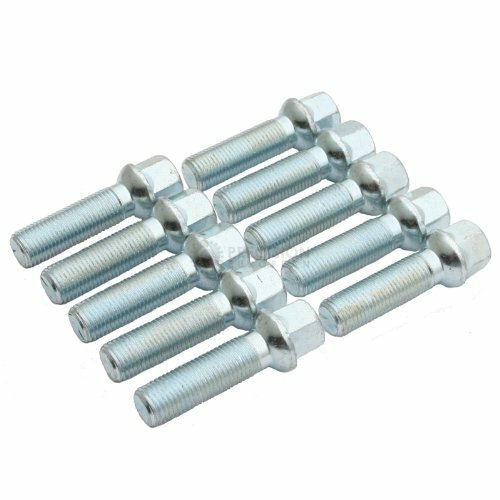 Pack of 20 - Silver Bolts.